One year ago I like use Email client to receive and send email such as Eudora or Foxmail, but I changed my way now.You know why? I like use online email servers like Gmail, Yahoo, or Hotmail to get and send email, that cause I do not want open two big applications to waste PC memory. My internet life is not only received and sent email, I spent a lot of time online to search something, to read something, to write something. Use online email server is easy way, I do not need open or even download/install an email client. I know some people like use email client, it should be easy for them. I think best point is you can receive/send email via pop3/smtp, so you do not need log in your email accounts again and again. I miss that, and I also use a small application to get some emails either. 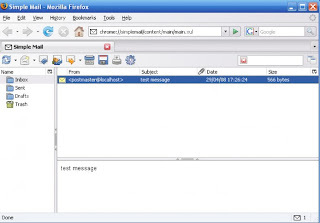 Do you think you can use Firefox to receive/send email via pop3/smtp as an email client? 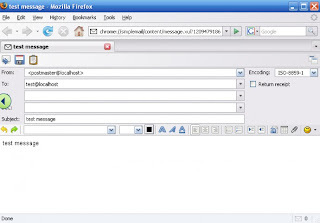 Simple Mail is a add-on of Firefox, it is small but useful. You do not need open other email client, just use your Firefox browser but the interface similar an email client. You can add your pop3/smtp email accounts as in an email client. After that, you can receive/send email via pop3/smtp servers. Simple Mail is a pretty cool Firefox add-on application. I do like it. Only thing I do not like is it can not save passwords.